It was great to publish the first pass at the Energy Plan for South Australia and read the feedback. The additional knowledge I have gained out of the process has already proven very valuable. For those who haven’t read it, it’s probably essential background to this update. In this post I will better explain my particular vantage points and my next round of thinking in the context of responding to some of those queries. The core criticism of the focus on the mPower is that is brings uncertainty. While the design appears to be gathering a great deal of momentum, it is not yet approved and has not yet been constructed, so the criticism is perfectly valid. Now, while the argument of “nuclear power will take to long” is fallacious for a great many reasons, some realities though are worth keeping in mind when thinking about what ideas to take to people. These realities are partly about nuclear, and partly about any initiative of this scale. South Australians next go to the polls in 2014. So that begs the question: would either of the major parties take a platform of energy reform and climate change, including the consideration of nuclear power, to that election? I dearly hope so but there is no guarantee. However the issue is sufficiently critical that it will almost certainly start coming up after that. So I have provided a potential timeframe for the implementation of nuclear power in South Australia assuming I get my wish and it is taken to the next election as an issue. You can sink your teeth into/ criticise/ correct this to your heart’s content. I hope it is lost on no-one that in this approximate 12 year timeframe, only 4 or so years are for the actual nuclear power plant bit!!! The rest is us getting our act together. It’s that part that I hope Decarbonise SA can help to condense . This scenario does not assume a firm lead shown at the Federal level of Australian Government that could potentially bring these timelines forward. It could move back assuming that no one wants to talk about it in the next three years. Given that energy is becoming such a critical issue I really hope this won’t be the case. But it may be. To me, considering the mPower design or similar for its many design advantages is not so risky in this context. Of course it is not the only thing Decarbonise SA should promote. But confining the discussion to AP1000’s and CANDUs seems unnecessarily limiting. However, it’s a very good idea to know and understand these technologies to be able to tell South Australians what could be built immediately if we really got our skates on. 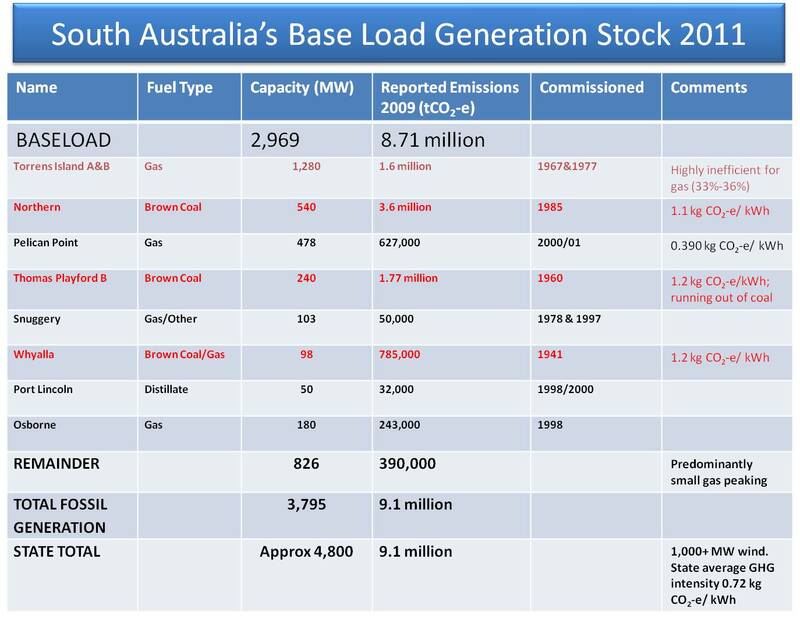 No base load power replacement for South Australia is going to be what you would call cheap, but compared to the other main option that will be pushed very hard (gas), in capital terms nuclear is still expensive. Unlike gas of course it’s fully insulated from a future carbon price and largely insulated from future fuel prices, and it has been shown to provide electricity at good prices. But nonetheless, the upfront cost matters. 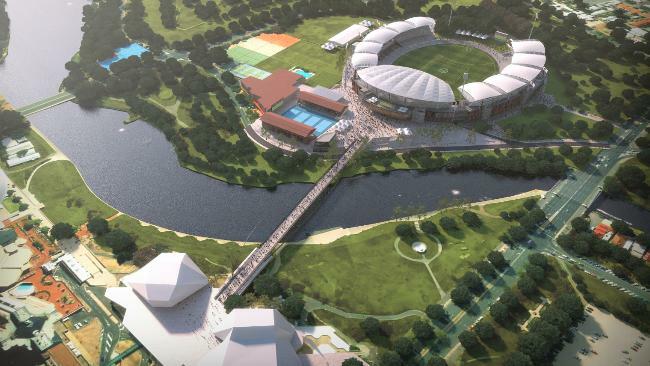 South Australia is committed to some pretty big bits of infrastructure (stadium, hospital) at present. I will discuss costs more specifically, but I am first doing some more homework in this area, since “understanding the cost of new generating capacity and its output requires careful analysis of what is in any set of figures” . It matters a great deal whether we talk about Capital cost only (incorporating engineering-procurement-construction (EPC), plus owners costs, cost escalation and inflation), or Capital plus Financing (Financing costs being highly sensitive to construction delays, as nuclear opponents know and exploit). 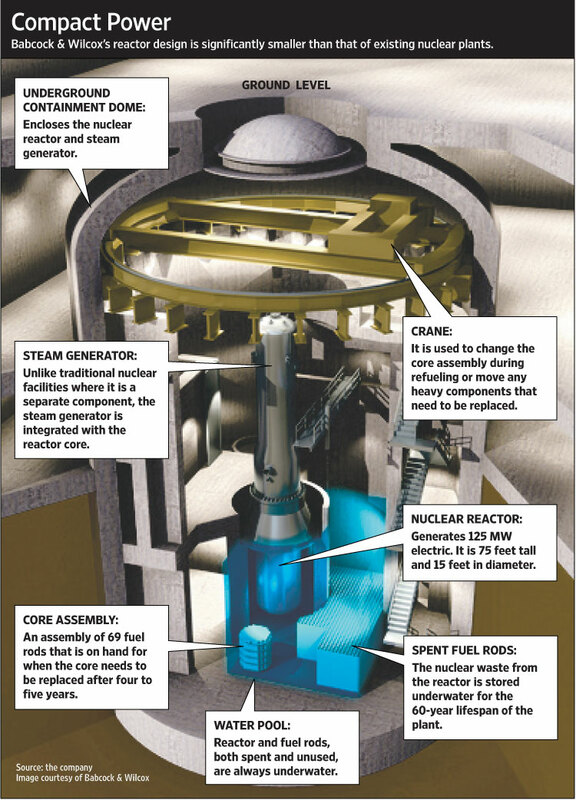 A lot of the costs mentioned above are, or should be, non-exclusive to nuclear power. Owners costs, inflation, and financing costs should be perfectly relevant to any competing technology as well as nuclear. But you can see the next substantial advantage of small modular designs; the ability to invest lesser amounts over a longer period of time and build up the capacity into the future. This makes financing easier and cheaper, and lessens the risk of financing cost blowout. Even with the current uncertainty of the new design, this again raises the appeal of an SMR focus. This is probably one of the lesser influences, but leadership has a definite political appeal. South Australia being a relatively small pocket of the world, we are always pleased to be doing something that is right out in front. The mPower design or similar meets that criteria; there would be the potential for South Australia to be among the very first customers. Considering the timeframe outlined above (or something like it), I think it is perfectly possible to put this on the radar as a conversation starter without insisting that it is the sole or best option for SA. It is only sensible to look at the generation system as a whole devise an optimised system. But I am deferring that task until I have had the opportunity to sit down with some of the state’s network engineers, because my knowledge there is rudimentary. I do understand is that some level of “balance” in generation across the network is beneficial i.e. power being generated close to the different centres of demand. You can approximately see that in the grid in SA right now. 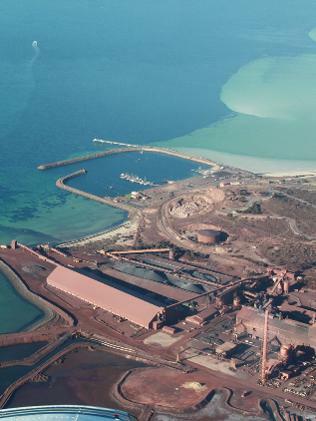 The Whyalla Plant is close to Whyalla One Steel. Playford and Northern serve Adelaide to the south and presumably also help to push some power further north. Torrens Island and Pelican Point take care of Adelaide, and then you have a few smaller generators in a pocket in the South East, close to Mt Gambier and some other regional centres. So it’s not automatically true that we could/should just bundle the lot up into three AP1000s on the same site and everything will be sweet. That makes changing the Whyalla Plant to nuclear, without an SMR, a lot harder because it is far from anywhere. 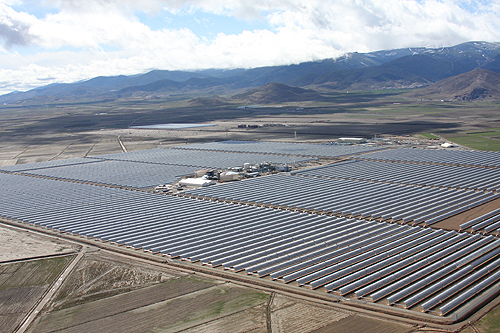 However, if it were replaced with a CANDU 6E at 700 MW, that would boost the regional generation a heck of a lot. This could really assist with the increase in mining that may occur on the Eyre Peninsula, such as near Tumby Bay to the south-west of Whyalla. That could be perfect. But I think the main consolidation issue comes from the capacity factors of the current base load. Subscriber Neil Howes put me on to this. Based on my calculations (that reinforce those Neil gave me), Northern and Playford Power Stations run at capacity factors of a little over 60%… that’s not very high. I’d like to know if there is a good reason for that. To derive the amount of electricity these two plants give us (which is about 4.2 million MWh per annum from combined capacity of 780 MW), would actually only require 500 MW of capacity operating at 95%. My numbers for Torrens Island give me a capacity factor that is so low I don’t want to post it until I can confirm. Did the task at hand suddenly get a whole lot cheaper??? Please enlighten me if there are good, sensible reasons for three baseload stations operating at around 60% or less. 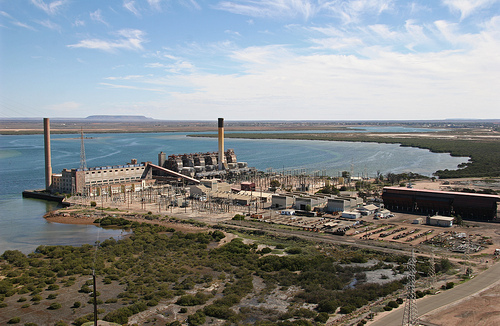 What’s up with the low capacity factors at Playford, Northern and Torrens Island? I think it is wise to continue my public engagement by providing two different nuclear power set-ups for consideration. One, perhaps to be termed “Rapid, Current Designs” could be more reflective of the feedback from Part I of the plan, focussing on AP1000 and CANDU technology. This scenario would earn points for certainty in cost and design, ability to implement sooner if other factors can be brought forward, and the use of CANDU that can run on natural uranium from our back yard. 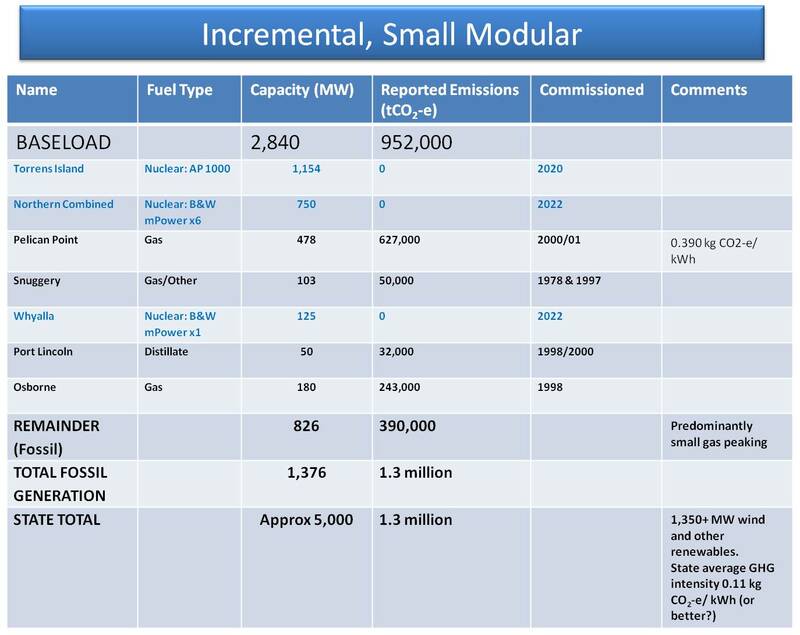 The other, perhaps to be termed “Incremental, Small Modular” could show a focus on the blend of AP1000 and Small Modular Reactors as I outlined in Part I. This scenario loses points on certainty of cost and design (in 2011), but gains points for safety, leadership, public and political appeal. I’ve provided three tables below. The first is our baseload as it stands. 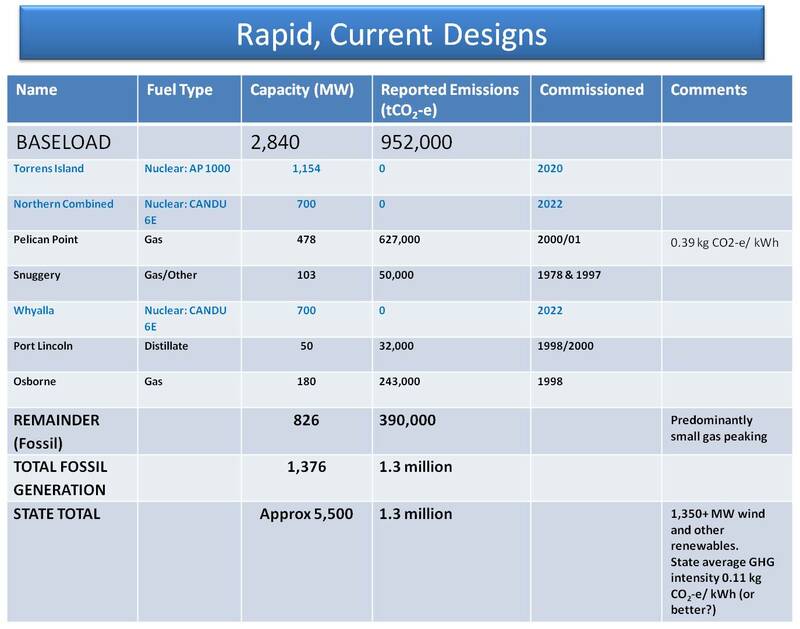 The second is the “Rapid, Current Designs” nuclear implementation scenario. The third is the “Incremental, Small Modular”. These will of course change as we go on, but they should be adequate to the task of getting South Australians learning and talking about nuclear power and how it might fit into the state. I hope to restructure my presentations to bring these in for discussion. In the background, I think it is time to start talking with some network experts to refine and put more rigour around these scenarios for the more senior levels of engagement in business and government. I also need to get properly up to speed for discussions of costs. So there’s Part II- an evolution, not revolution, of Part I. Let me know what you think. My guess would be that the unused capacity comprises much of the reserve needed to (try to) cover the demand spikes from aircons etc. on hot summer days. And one minor quibble, ‘South Australians’ does not have an apostrophe. Well I would have thought a similar reason, but I am just suprised that the unused capacity is that much. I would like to find out whether that is a pretty flabby arrangement or whether it really needs to be that way. You are going to have more than enough trouble getting the usual culprits to even utter the dreaded N word without advocating technology which has no proven track record. Push proven technology ike Candu.That way the members of the inevitable parliamentary committee of inquiry (if you get that far) can swan off to the Northern Hemisphere in summer and look at the built infrastructure.A quick build of a reactor or 2 of this sort will probably get the brown coal incubus out of the picture. Your favoured small modular reactors would readily slot into the gas and diesel situations at a later date. Fair points, but I’m not as certain as you that that is the right strategy. My plan is to move away from pushing anything per se, and instead bone up properly on CANDU so that I can provide informed discussions of both and see where the discussions lead with different parties. One reason for the low capacity factor of the three older FF generators may be the very high peak demand in SA> 3,000MW while av demand is 1550MW and off peak <1000MW. This means that nuclear base load of 1000MW would still need to import power or use FF for peak demand or have a higher nuclear capacity and find a market for excess electricity during off peak periods( such as desalination) that can be shut down during peak demand. The way I see it, our main objective right now is to help the public understand why nuclear power is necessary. At a technical level any configuration of NP would eventually decarbonise SA baseload, so which plan we take up is not particularly important in terms of capacity to decarbonise. What we are going to try to do with these plans is win hearts and minds and on that level, the plan we choose to promote should be the one which best fits our listener’s ideology and addresses their concerns. For this reason I think having the two plans is a good idea. Different plans will appeal to different people, for different reasons. For my part, I can see the advantages and difficulties in both plans. Going on my experience advocating IFR I can see the cost and design uncertainties inherent in the IMR plan are exactly where the rusted on anties will fight you – and they will make these uncertainties political. I can already hear their ‘objections’. “They only exist on paper.” “Show me a single commercially operating SMR and then I’ll believe your cost estimates.” And so on. Conversely, I can see at least one area of public appeal and political acceptance for the Rapid, Current Design (RCD) plan. I’ve already mentioned the oft dreamt about schemes involving the government just knuckling down, implementing a massive renewable roll-out and shutting down coal a classic example of which is the sadly inadequate solar-panel-on-every-roof dream. What these schemes and dreams show is that almost anyone who is in the least concerned about CC has fantasied about strong, clear, large-scale projects at some time or another. Your RCD plan is that project. That sums up my thinking nicely. No point pretending that I am in charge of these decisions. The scenarios are, at this stage, tools for building the conversation with different parties, both general public and individuals in a greater degree of influence. Over time they will become more complex and robust as required. Winning hearts and minds is a good description, and I think part of that is taking matters out of the realm of the theoretical and showing people what it might actually look like in SA. I may find in my public presentations that I get loads of support for the RCD approach. That will be interesting information to take into my more targeted meetings. Ben I was thinking about your multiple plan idea and how it ties in with the need to show why nuclear power is necessary. At the moment the two plans show quite clearly that nuclear power is able to displace fossil fuels in providing SA baseload, but, playing devils advocate, so what? If it is not clear that renewables cannot do the same job, in roughly the same time frame, for roughly the same cost, then why would one choose the nuclear power option over the renewable one? Perhaps we need to include a third renewable “plan” (or attempted plan) for comparison. One which shows what it would take, relative to NP, for renewables to decarbonise SA baseload (or indeed, if it is currently even possible). I realise this would be a difficult undertaking but perhaps you wouldn’t have to start from scratch. Are there any environmental groups in SA who have attempted such a plan? If so, perhaps their plan could be adapted to fit Decarbonies SA’s initial baseload target. You could then compare it’s feasibility to that of your NP plans. Here is a plan to decarbonise the UK electricity sector. Check out the imports, back-up and – on the demand side – behavioural changes required to reach a 79% reduction in CO2e from 1990 levels by 2050 – no mention of cost. Then again, I think some of the assumptions built into this model are questionable (e.g. Why can’t a combination of nuclear and hydro (or storage – whatever that may be) replace at least 90% of the fossil fuels and create a balanced system in the electricity model? After all, they do it in France. ), still, something to use as a guide perhaps. Nice update Ben, and I’m looking forward to further development of these ideas. A wet long weekend finally gives me an opportunity to offer some feedback. This provides the larger context in which consideration of an immediately actionable plan takes place. It should give the community the confidence it needs to choose a nuclear future. 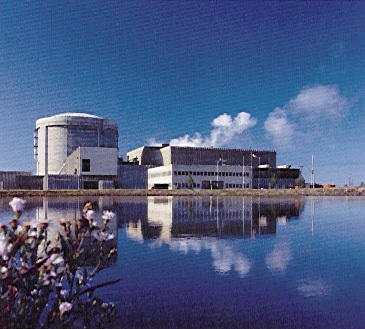 It also provides a circuit breaker to the usual objections and provides an opening for communication with those who reflexively oppose nuclear power. “Have you heard about these new nuclear reactors that eat nuclear waste?” has led to quite a few positive conversations for me with people who wouldn’t generally respond to NP. But these new designs should not themselves be part of the plan, until there is very high confidence in their availability. The threshold level of confidence should be at a minimum the supplier being prepared to accept orders. The way Ziggy Switkowski has put it (eg. ABC’s “Background Briefing” of 5th June) is that when Australia is ready to go nuclear, we will choose a reactor design from a catalogue, pick up the phone, and place an order on a Chinese supplier. A plan that can be realized by such a simple, definite action has rhetorical potency. It also has a moral potency, because it makes explicit exactly where the responsibility for action lies: us. If we advocate a gen IV path, or an SMR path, we can get away with delaying our decision, because the ball is with B&W, or GE, or the US NRC, or some other entity. But if we advocate a path using available technologies, there is no-one stopping us from making that phone call today. We have the responsibility to choose, to act or not to act, and the consequences of that choice are ours to own as well. Looking at your timings, there is a good chance that availability of the mPower (and other designs) will intercept your schedule. Fine. The way to manage this is to have a current Plan of Record, using low risk commercial options, and a list of contingencies waiting in the wings, and roll those contingencies into the POR as the risks around them drop. But at any point in time we have a Plan of Record that is one phone call away from reality. In fact, call it the One Phone Call plan. If Decarbonise SA hits the airwaves with its One Phone Call campaign, that would cut through. Thats a nice sound bite. Its a simple message. People could get behind that. And it prevents mischief being made around use of non-commercial technologies. Consider also that if the mPower lobs, in, say, 2020, that reactors like the AP1000 will not be standing still. In the time required to get to the point of placing an order for an mPower, there will have been many more build completions of AP1000s. The suppliers will have gained experience with builds, refined their processes, increased the mass manufactured content of the design, and so on, which will all reduce the build time, the cost, and uncertainty relative to today’s build process. Another way to look at it is to consider the intersection of both the Rapid Current Design plan and the Incremental Small Modular plan. The component common to each is the AP1000 at Torrens Island. Each plan has the same initial milestone – getting that first, big, off-the-shelf AP1000 spinning turbines. Thats the immediate goal. By the time clear community and political commitment to that critical first step is made, the availability and maturity of other options will be much clearer. ‘Playford is running out of coal’ has been disputed by Giles Parkinson at Climate Spectator (http://www.climatespectator.com.au/comment/reply/88541/50876), on the basis that Leigh Creek is slated to sustain the Northern Power Station until 2030. What were your grounds for saying Playford has only a few years coal left, Ben? If Leigh Ck coal field has 20 years left that’s not enough to justify even refurbishing existing coal plant. If the Playford site is turned into a solar thermal steam generator to boost the nearby Northern coal station I believe that will be the third in Australia after Liddell NSW and Kogan Ck Qld. In all cases lots of capex and REC payments for very little power boost. If anything it highlights the magnitude of the coal and gas replacement problem.